Unfortunately, scars appear for lots of reasons and everyone has a story to tell about how they got this scar or that scar. Some of us ignore the scars and others of us are eager to see how much can be done to minimize their appearance. 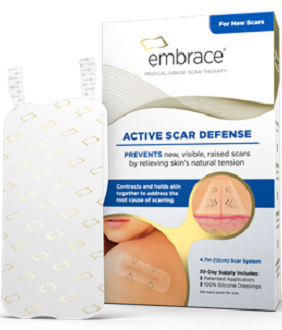 Today we are reviewing Embrace Active Scar Defense, a scar management product that works to minimize thick, dark colored, and raised scars by holding the closed incision together and protecting the incision from the movements you make. This product is designed for new scars that have formed within the last 6 months. 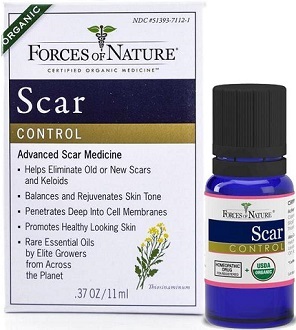 For older scars, this company has other products that they sell for that purpose. This product used what is called Stress-Shield technology that is 100% medical grade silicone and adhesive. It hydrates and softens the skin, and does not have latex. It is best to start using this product 1-4 weeks after your sutures have been removed but you should not use this product if there are scabs. The manufacturer states that the earlier you treat the scar, the better. First, clean the scar with an alcohol rub. After drying, apply the Embrace pad to the closed and dry incision. You can use each dressing for around 10 days. The manufacturer recommends applying it at night about 2 hours before going to sleep to be sure that the adhesive fully adheres to your skin. To remove the dressing, do so with much care by pulling the tab and gently removing it. Best to wait approximately 12-24 hours before applying a new dressing. You should begin to see the initial results around 4 weeks after using this product, but the time can be variable. You may this use up to 60 days, and the impact of the treatment will continue to show improvement for up to a year. This product is available in a number of different sizes and both the manufacturer’s and third party websites show the size chart templates for the dressings in comparison to a deck of cards and coins so you can best guestimate the right size you’ll need for your scar. There are 3 bandages per package. The manufacturer provides free shipping in the US for orders over $50. Refunds are available on unopened products only within 90 days of the purchase, and only for products sold directly by the manufacturer. Return shipping costs are paid by the customer. This product has been designed to give your skin a chance to heal so that your scars lighten as much as possible. Unfortunately, the reviews of this product are so mixed that we recommend that you think carefully about whether this is the right product to choose at this point. Each bandage costs a lot and though they are designed to be used for 10 days a time, customers; feedback repeatedly stated that the pads simply do not stay on as long as needed. Moreover, customers say that they did not see the results that they had hoped for and that the dressing was itchy and began to come off if you started to sweat. So there are a lot of concerns about this product. For all these reasons, we do not give this product a strong recommendation.